Graphics programmers aren't the only ones who need to be proficient with graphics. Web and applications programmers know that a dull web page can be quickly transformed into one that's interesting and lively with the use of well-planned graphics. And fortunately, you don't need the skills of a fulltime graphics programmer to use graphics effectively. From access counters and log report graphs to scientific plots and on-the-fly animated GIFs, graphics scripting is within the grasp of most web programmers. Using open source software, like Perl, you have the power to dynamically generate graphics based on user input and activity, easily manipulate graphics content, and optimize graphics for compression and quality. You'll begin with a tour of the most common web graphic file formats--PNG, JPEG, GIF, SWF, SVG, Postscript and PDF--then you'll explore the most powerful tools and Perl modules available for manipulating these graphics, such as GD, PerlMagick, and GIMP. Included in this part of the book is a thorough description of the Ming module for creating on-the-fly Flash files. Next, a "cookbook" section includes practical, all purpose recipes: GIF animation, generating images within a dynamic application, communicating between SWF front-end and Perl back-end, XSLT transformations, compression, and much more. 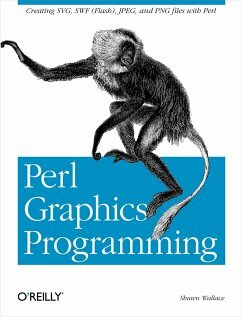 Perl programmers naturally turn to Perl to tackle whatever challenge they have at hand, and graphics programming is no exception. Perl Graphics Programming provides all the tools you need to begin programming and designing graphics for the Web immediately. This book will change how you think about generating and manipulating graphics for the Web. Shawn Wallace is an editor at O'Reilly and lives in Providence, RI. He is also a member of the Fluxama artist collective responsible for new iOS musical instruments such as Noisemusick and Doctor Om. He designed open hardware kits at Modern Device and taught the Fab Academy at the Providence Fab Lab. For years he was the managing director of the AS220 art space and is a cofounder of the SMT Computing Society.